Continuing our look at prospects considered the most likely to be selected by the Redskins with the fourth overall pick in next month's NFL Draft, today we turn out attention away from the glamorous, high-profile quarterback position to the blue-collar, concrete-and-steel position of offensive left tackle. 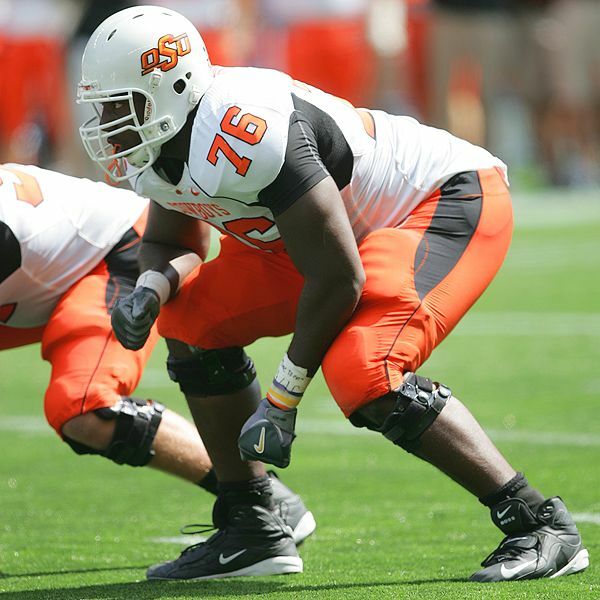 Below you will find biographical data, scouting reports, draft projections, rankings and videos on Oklahoma St. LT Russell Okung. Those hearty enough to wade through to the end will find my quick take on the player himself and, on the premise that they will use and not trade their top pick, my thoughts on whether or not the Redskins will and/or should draft him. If you've been looking for BGO or TN today (and really, who could blame you?) and getting a crocodilian Hostgator "whoops" page* instead, fear not. Yes, we've paid our bills. No, you haven't been banned. Probably. Both sites will be back up and running as soon as HG finds the unplugged plug someone must have tripped over and ... you know, unplugged. Meanwhile, all the dreaded "red X" images you see all over this silly blog are not evidence that the Mayans were right. Just another day on the wild and woolly world wide webbian frontier. * Update 3:55 pm EST - Whoops has been replaced by Under Maintenance. Rebirth may be nigh. Do you know where your offensive line is? Today marks the beginning of "voluntary" workouts at Redskins Park. 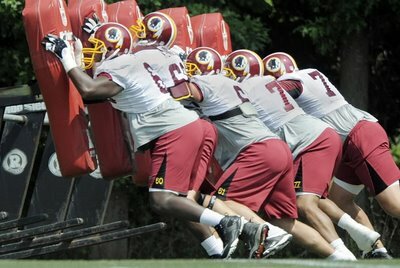 At some point during this damp, overcast day, one suspects new Redskins head coach Mike Shanahan will turn his gaze upon the group of offensive linemen working out in the shiny new weightroom in Ashburn. Don't panic fellow Redskins fan. At least not yet. There is no more relevant a subject in the Redskins universe today than the quarterback position. And no wonder. Incumbent Jason Campbell has been tendered but is far from a lock to be the opening day starter. The Redskins head into 2010 with a new coaching staff and general manager, and possess the number four overall pick in April's NFL Draft. It comes as no surprise that speculation is at full boil as to whether or not they will use that pick to select a quarterback. We previously looked at Oklahoma QB Sam Bradford, who at the time was considered the odds-on favorite among mock draft gurus to become a Redskin. Since then, Bradford has risen up many of those draft boards and is now widely considered as the potential number one overall pick to St. Louis. Notre Dame QB Jimmy Clausen has emerged as a candidate to take his place. For your consideration and one-stop shopping convenience, here is a compendium of statistics, scouting reports videos and more to help you fill in the gaps. For those stout of heart enough to wade through the entire piece, my thoughts on Clausen are at the end. Few would have bet that five days into free agency, the Washington Redskins would have signed just one player—a journeyman offensive guard. No, if you had been forced to bet your own money, you would have bet that by sun-up on Day One, the Redskins would have landed a DE Julius Peppers, LB Karlos Dansby or LT Chad Clifton. Maybe more than one. As Day Six of the 2010 free agency period slides uneventfully by, the lead story in the Washington Redskins universe continues to be their silence. With the exception of signing unsexy OG Artis Hicks (nothing personal big man) to an average contract (3 years, $9 million), the Redskins have kept their hands firmly buried in deep pockets, watching other teams earn the headlines.